Robert Gallucci, former U.S. negotiator with North Korea at the 2013 Asan Nuclear Forum. (Seoul, Republic of Korea)—North Korea’s third nuclear test on Feb. 12 sparked concern in the international community about possible qualitative and quantitative improvements to Pyongyang’s nuclear arsenal. But concerns about an increasing number of nuclear weapons on the Peninsula should not solely be limited to the North. Recent polling data collected by the Asan Institute indicates that the majority of South Korean favor acquiring their own nuclear arsenal. A public opinion poll conducted Feb. 13-15, 66.5 percent of South Korean’s polled said Seoul should develop its own nuclear weapons program, and 67 percent said that U.S. tactical nuclear weapons should be re-deployed in South Korea. Not only is U.S policy toward North Korea failing to curb its nuclear program, but Pyongyang’s continued progress is threating the future of the nonproliferation regime. While it is unlikely that South Korea will immediately follow in Pyongyang’s footsteps and withdraw from the nuclear Non-Proliferation Treaty (NPT) in order to pursue nuclear weapons, or that the United States would re-deploy nuclear weapons in South Korea after having withdrawn them nearly 22 years ago, these numbers should serve as a wake-up call to policymakers: the current strategy for dealing with North Korea is not working, and with Pyongyang committed to moving forward on its nuclear and ballistic missile programs, it is time to get serious about returning to negotiations. At the 2013 Asan Nuclear Forum, the question of how to engage with North Korea figured prominently on the agenda of the first day. Negotiating with North Korea, he said, requires a greater understanding of the intentions of Pyongyang’s nuclear weapons. Gallucci, whose efforts produced the largely successful 1994 Agreed Framework, said that the right combination might still be found to defuse the situation, limit the North’s growing nuclear and missile capabilities, and build trust. If it can be discerned that North Korea is willing to denuclearize, nuclear weapons, however, should not be the sole focus of talks. Talks should “address a range of political, economic, and security issues,” he said, while the “end-game” must envision North Korea abandoning its nuclear program. On the other hand, if North Korea is seriously seeking to hold U.S. cities hostage to an ICBM threat or unify the Korean Peninsula by force, then the “constant avoidance of conflict” rather than defusing tensions may be the best that can be achieved. Another former U.S. policymaker with experience negotiating with North Korea, Joel Wit argued that diplomacy is not only about reaching agreements, but also provides clarity into North Korea’s intentions and helps build diplomatic coalitions, particularly with China. Wit’s point is worth bearing in mind. While Pyongyang has certainly proved that it does not always approach negotiations in good faith or follow through on agreements, given the isolation of North Korea, it is difficult to determine the motivations and characteristics of the regime if there is no contact. Gallucci also emphasized the growing threat posed by North Korea’s ability to sell nuclear materials or technology to non-state actors. He said that for the United States, this represents a greater security threat than a nuclear strike delivered via an intercontinental ballistic missile. Aligning perceptions of the threat: the five countries that have been involved in negotiations with North Korea (China, Japan, South Korea, Russia, and the United States) all view the threat of Pyongyang’s nuclear arsenal differently and have different priorities in the negotiations. Greater coordination amongst these parties is necessary to present a unified front to North Korea. Coordination and enforcement of sanctions: mechanisms such as sanctions and interdiction efforts must be better enforced, although they will not reverse North Korea’s progress, enforcement will slow development and stem proliferation. There was less-consensus on the utility of further sanctions. Seeking broader discussions: Many panelists agreed with Gallucci that negotiations cannot simply focus on denuclearization and must include economic and political aspects. China: The official view from Beijing is that North Korea’s behavior is unacceptable but there are limits to China’s influence. Experts from South Korea, Japan, Russia, and the United States, however, all agree that Beijing can and must do more to exert more economic pressure on the North Korean regime, which depends heavily on China for food, fuel, and commercial goods. 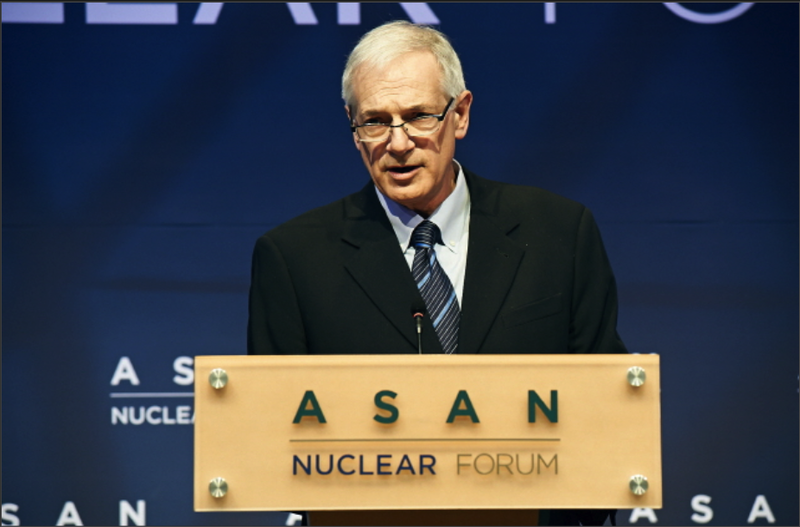 The full agenda and selected presentations from the 2013 Asan Nuclear Forum are available online. This entry was posted in Asia, China, Japan, North Korea, Nuclear Weapons, Pakistan, Russia and tagged North Korea, North Korea Nuclear Test, Nuclear Nonproliferation Treaty, nuclear test. Bookmark the permalink.